Scotland's greatest patriot surely deserves better? Seven hundred years after he was publicly executed, William Wallace is being subjected to a final humiliation. But not by the English. This time, the freedom fighter is being slighted by his fellow Scots. The Wallace-mania stirred up by Mel Gibson's Braveheart 10 years ago seems to have settled back down to apathy. 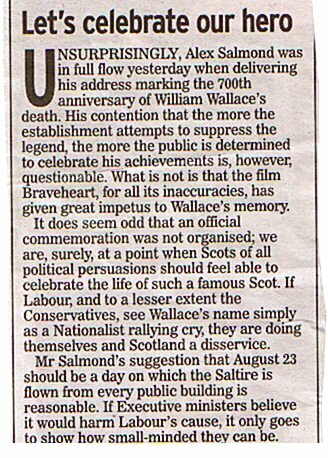 On August 23, the date of Wallace's death, there will be no national commemorations. There are no plans to stage events along the lines of those held last month to mark the 200th anniversary of the Battle of Trafalgar and the death of Lord Nelson. In Scotland, the anniversary of his death will pass with barely a whimper. The First Minister's plans to publicly mark the date seem to extend no further than attending a gala dinner at Stirling Castle. But it will be for invited guests only. A Scottish Executive spokesman tried to explain away the apathy, saying: Well the 23rd is a Tuesday - a midweek day. I mean, it doesn't really suit many people, does it? I would expect the First Minister or the minister for tourism, culture and sport, Patricia Ferguson, will acknowledge the anniversary on the day itself. But there are no further details at the moment. It's still being organised. 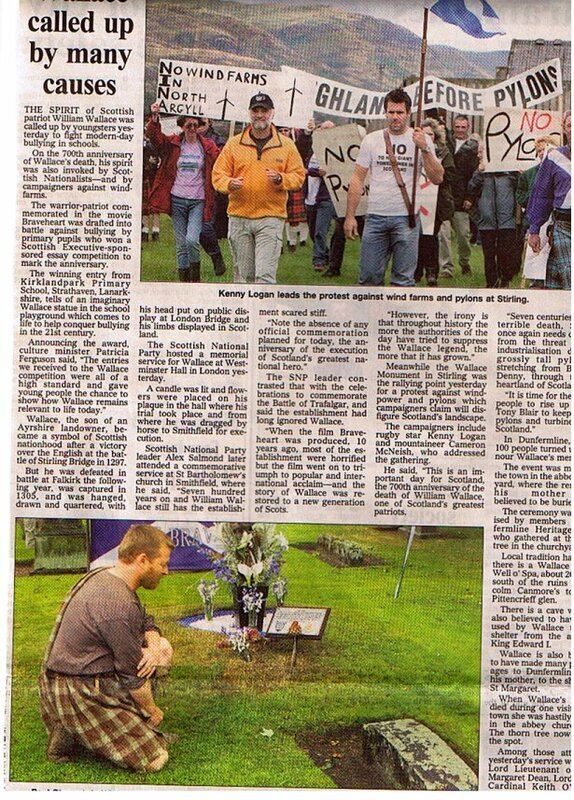 David Ross, convenor of the William Wallace Society, feels that's pathetic. He is on a one-man, 450-mile walk from Robroyston in Glasgow, where Wallace was captured, to London, where he was executed. David, an author and historian, said: "What makes us Scots is that we share a common history and we have to acknowledge that history. It seems only natural we would look to our leaders in the Scottish Parliament to lead the way. But sadly, when it comes to knowing what the people want, it seems the film-makers in Hollywood have a better understanding than the politicians do." Not that the apathy extends to all Scots. David's long slog has been eased by words of encouragement as he crossed the border into England. He said: "I've just received a phone call from Sean Connery, telling me how proud he was of what I'm doing." Wallace was executed on August 23, 1305, accused of being a traitor to the English king Edward I. The 35-year-old warrior was hanged, drawn and quartered and his head impaled on a spike near London Bridge as a warning to other would-be rebels. His remains were ultimately destroyed, so that there would be no shrine for his followers to visit. St Bartholomew s church in Smithfield, where Wallace was put to death, has become the focus for those who want to mark his life. And that's where David will end his walk, leading a service for 300 people. But Westminster Hall could easily be the venue for a Wallace tribute. He stood trial there and was found guilty of betraying a monarch to whom he had never sworn allegiance. A plaque bears testimony to that. But it looks like Stirling Council, and one or two other local authorities, will be left to carry the torch for Wallace. They have been staging various events throughout the year. We should fly the Saltire from every public building - high and proud. Alex Salmond, leader of the SNP, reckons Scotland should fly the Saltire on the 23rd of this month. 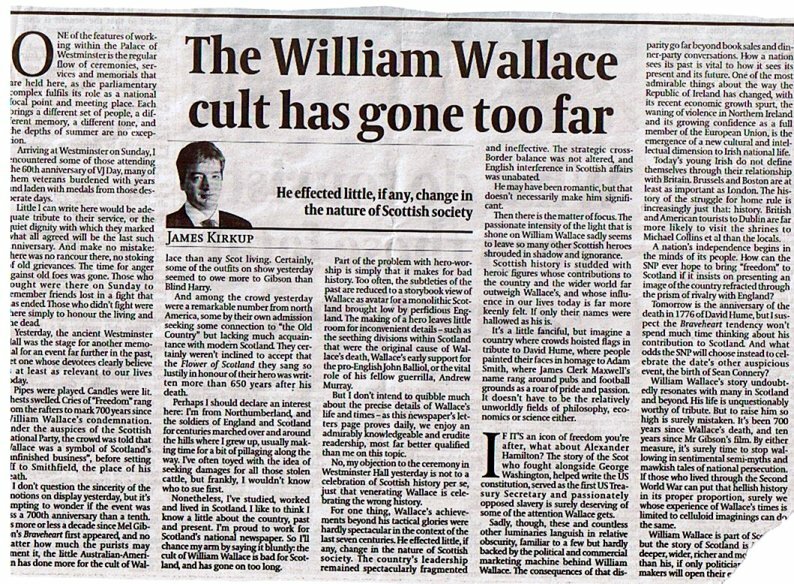 Wallace still has the establishment scared, 700 years on. Note the absence of any official tribute. The anniversary of his death will be marked only by the activities of the many grassroots Wallace societies, which still flourish. The contrast with the recent Trafalgar anniversary is telling. It was celebrated by official pageantry and TV specials. The toom tabards in the Executive have arranged NOTHING. It was ever thus. When the Wallace Monument was built in the 19th century, every penny was raised by public subscription. 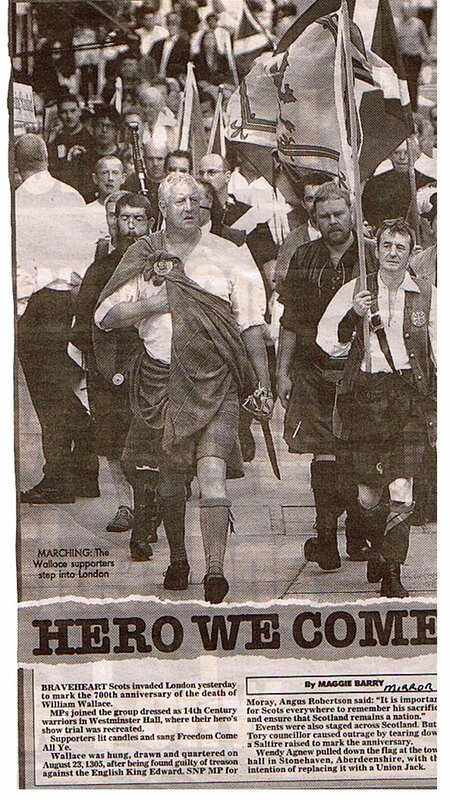 When Braveheart was made 10 years ago, most of the establishment were horrified that the film won international acclaim. Throughout history, the more that the authorities of the day have tried to suppress the Wallace legend, the more it has grown. We should demand that the Saltire is flown from every public building in the country on August 23, not at half-mast as in mourning. But high and proud in celebration of the man who ensured that Scotland lives. THIS morning I will set off from Robroyston in Glasgow, where William Wallace was captured, on a 450-mile walk to London, the journey the great man was taken on to die. On August 22 I'll arrive at Westminster Hall, where he was tried for treason. The next day, August 23, the 700th anniversary of Wallace's execution, I'll walk the six miles that he was dragged, tied to the tails of horses, through the streets to Smithfield. If people wish to join me for this historic section of Wallace's last hours, then they are more than welcome. The walk will end at the Church of St Bartholomew the Greater, the oldest church in London, with a private, invitation-only commemoration of Wallace. As Wallace was executed in front of this church, it is a fitting place. It may have taken Scotland 700 years to hold a funeral service for the man, but we can ensure that he knows he is not forgotten. This will be the mourning that Wallace never had. I will walk the 450 miles alone and well-wishers are requested to respect the fact that this is my own personal tribute to Wallace, and not accompany me. It is a long, long road, and not one to be taken lightly. The walk is about me putting something back. Otherwise the day of his death would pass unmarked. I have trained long and brutally hard for this it is 25 miles a day, like doing a marathon every day for three weeks. 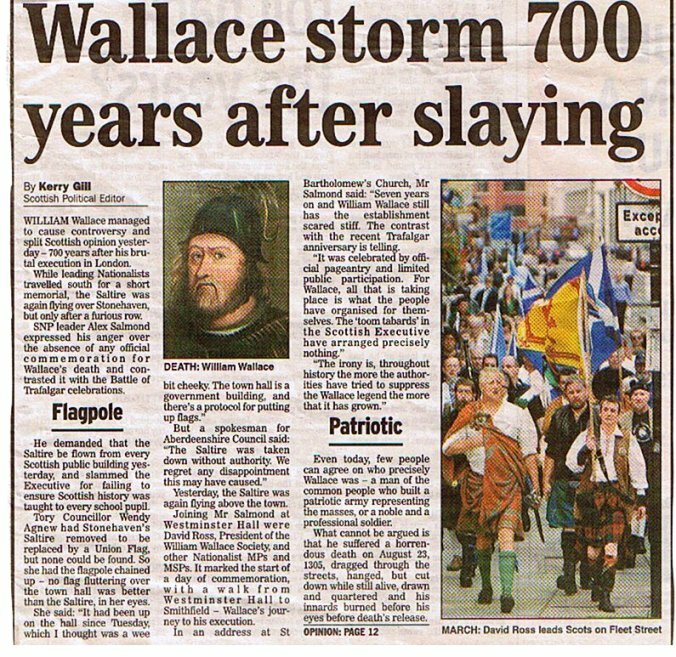 Happily, councils and towns along the route are planning civic receptions and commemorations of Wallace. Wallace has always been there. For every single generation of Scots who crave some sort of autonomy, Wallace is seen as the father of our patriotism, and the man who died trying to hold off the incursions of an aggressive invader. Blind Harry, which told his story, was the biggest selling book after the Bible, and in the 1860s, when they laid the foundation stone for the Wallace Monument, an astonishing 90,000 people turned up to watch. Wallace reinvents himself. It was only a matter of time before cinema found him in 1995 came Braveheart. 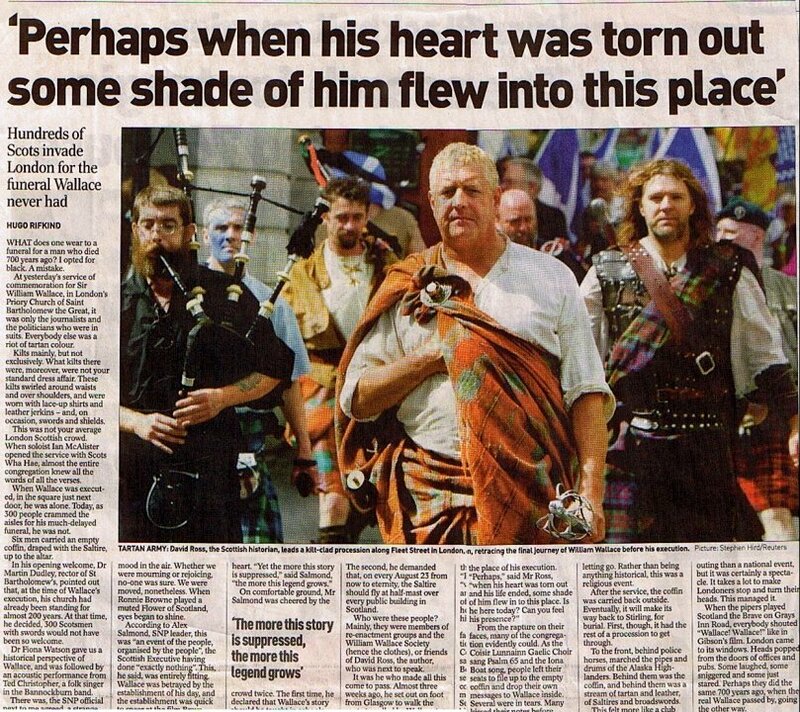 I honestly believe in my heart of hearts that Braveheart influenced the Yes-Yes vote. 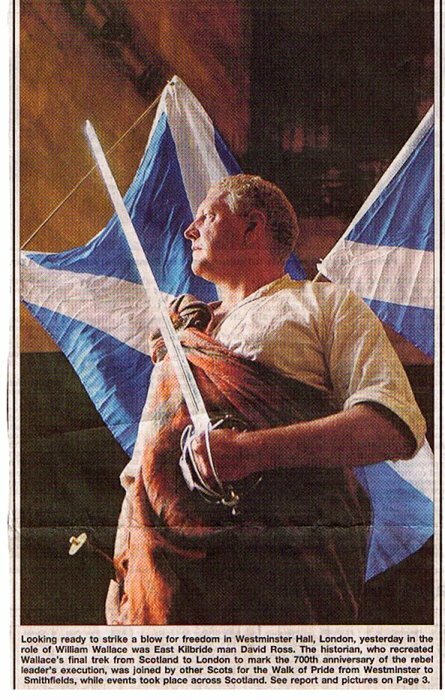 And isn't it seriously amazing that on September 11, 1297, Wallace fought the battle of Stirling Bridge, and 700 years later to the day, in 1997, the Yes-Yes vote took place? I identify with Wallace because what goes on his heart is what goes on in my heart. People say to me: "Why are you doing this?" I'm doing it because I recognise Wallace for the patriot he was, and for the fact that when he died he was far, far from home and all alone. It's a way of saying, 700 years on, that we haven't forgotten what you did for us. 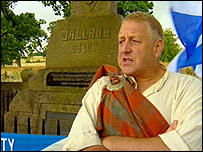 David R Ross is convener of the Society of William Wallace and has written six books, including On the Trail of William Wallace. His book about his journey, For Freedom . . . Alone, will be published by Luath Press in the autumn. 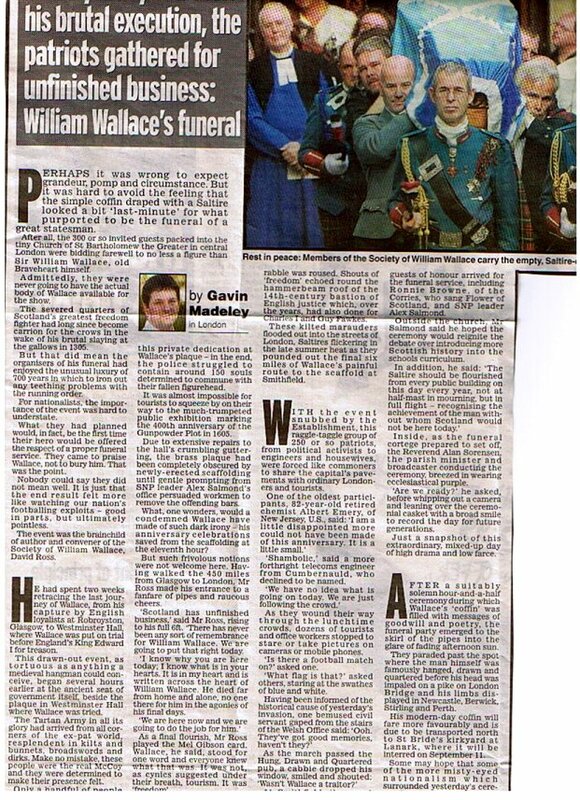 IT HAS taken 700 years, a Hollywood film and the occasional word of encouragement from Sir Sean Connery, but a funeral is finally to be held for William Wallace. David Ross, a Scottish amateur historian, will today embark on a 450-mile pilgrimage that will culminate in a service to the Scottish rebel and freedom fighter later this month yards from the spot where he was executed. The service at St Bartholomew s Church in the City of London, outside which Wallace s campaign against the English came to a gruesome end on August 23, 1305, is intended as the centrepiece of a series of commemorations marking the 700th anniversary of his death. 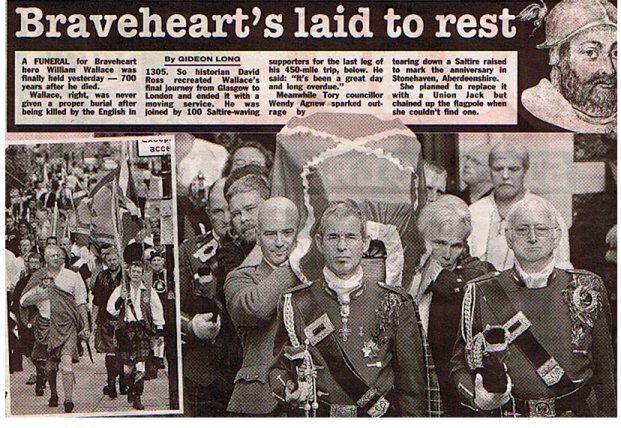 An open coffin will be placed at the front of the church, into which the congregation will be invited to drop personal notes and mementos of Scotland from miniature Saltires to thistles and white roses. 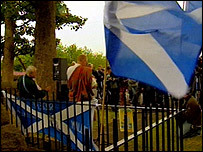 The service, to be conducted by a Church of Scotland minister, will include a performance of Flower of Scotland by the folk singer Ronnie Browne and a song composed for the occasion by Ted Christopher, who wrote a revised version of Knocking On Heaven's Door in the aftermath of the Dunblane Primary School shootings in 1996. There will also be speeches by Alex Salmond, leader of the Scottish National Party, and Fiona Watson, senior lecturer in Scottish history at Stirling University. The coffin - with a plaque bearing the message The spirit of William Wallace, 1305-2005 - will then be draped in a Saltire and carried through the streets of London before being driven back to Scotland for a long-awaited homecoming. It will spend three weeks lying in state as the centrepiece of a Wallace exhibition in Stirling before being taken to its final resting place at St Kentigern s Church in Lanark, where Wallace is said to have been married to Marion Braidfute of Lamington. Torches will be lit and doves released as the coffin is put on permanent display at the church. Mr Ross, who will spend the next two weeks retracing the final days of Wallace s life from his capture at Robroyston outside Glasgow to his arrival in London, said yesterday that the Scottish patriot had never been given a funeral. 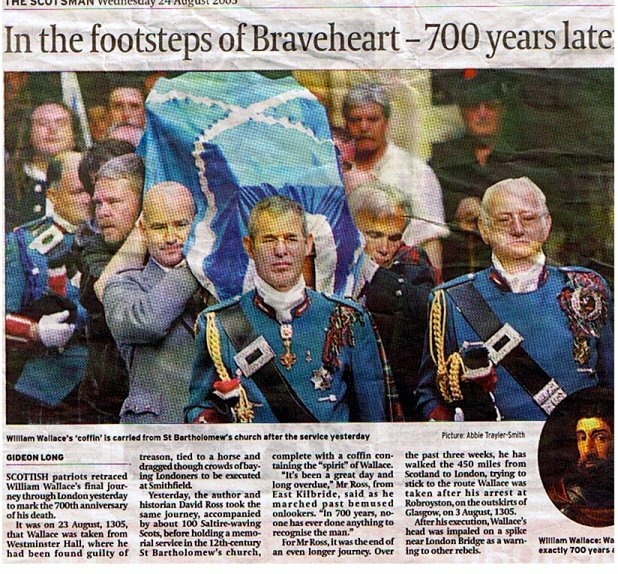 The historian, who will walk at least 20 miles per day until he reaches Smithfield in London, has spent months organising the funeral in his role as convener of the Society of William Wallace. Seven hundred years may be a long time, but by having this service we re basically saying that we have long memories, he said. It s pertinent that the service is taking place at St Bartholomew's in Smithfield because the church was the last thing that Wallace saw. He was hanged, drawn and quartered facing the church as a spectacle for Londoners. When Wallace died there was no one for him, he was far from home and all alone, and died in the most horrific circumstances. Wallace was scattered to the wind, his body itself was destroyed completely and utterly. But he still really means something in the hearts and minds of the people of Scotland and so this will be a process of the gathering of his spirit. Margo Steel, of the Lanark Wallace Trust, said that having the coffin returned to the town would be an undoubted boost for tourism. There was talk of burying the coffin in Stirling but I pushed the case for Lanark as there is no official memorial to him (Wallace) here. It would also be fantastic for tourism. Who wouldn't want to come and see the final resting place of a Scottish hero like William Wallace, she said. Vandals have defaced the Wallace Monument at Elderslie, near Paisley, only weeks before a rally to mark the 700th anniversary of his death. Graffiti was scrawled on the plinth, information plaques daubed and a fence destroyed.